You may not pay anything to use Facebook, but Facebook isn't free. The price of using the social network is your personal information, which Facebook collects in order to advertise to you. 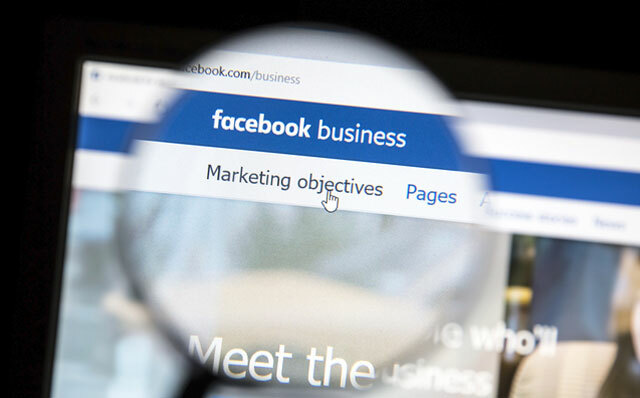 Facebook tracks 98 different data points for advertisers, from the basics like age and location to very specific information, like whether you're in a new relationship, recently returned from a trip or carry a credit card balance. Just how does Facebook know what it knows? It starts with what you've told it: your name, age, gender, location and other demographic information you put in your Facebook profile. It keeps tabs on which websites you visit — any site with Facebook "Like" and "Share" buttons let Facebook know you've stopped by — and it knows everything you've clicked Like on. That alone is a lot of information, but then Facebook combines it with publicly available information compiled by people search sites (check out our instructions on how to remove yourself from them). That lets Facebook know all sorts of details, from public records to employment information — and it's all used to help advertisers sell you things. 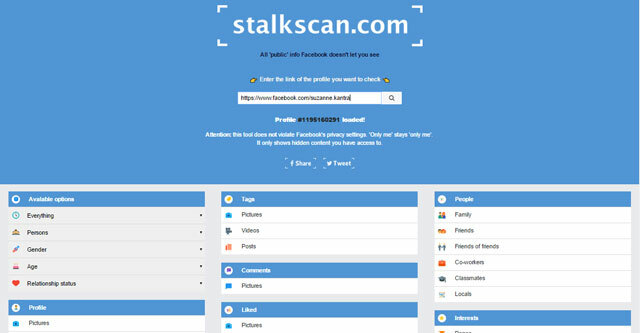 A tool called Stalkscan will show you everything Facebook knows on a single, easy to read page. Just enter your Facebook profile address and you can click on each option to find out what Facebook knows: from what you like to what kind of music you listen to. It offers a broad look at just how much of your life is on Facebook. Want to know more? The Chrome extension Data Selfie can give you a hint: it runs in Chrome and watches everything you do on Facebook. It sees what you look at (and how long you look at it), what you Like, and what you type. Then it analyzes your data using tools from IBM Watson and the University of Cambridge to show what Facebook might assume about you based on your activity. Seeing everything Data Selfie comes up with can be a bit creepy: it may accurately guess that you eat a lot of fast food or prefer comfort over style when shopping for clothes. While Data Selfie — and Facebook itself — can come to inaccurate conclusions, the technology that powers this kind of analysis gets better every day. How can I stop Facebook from tracking me? Ads based on my use of websites and apps: Which means serving you ads based on what Facebook can see you doing on other websites. Remember, it can track you on any website that uses Facebook "Like" and "Share" buttons, which is most websites. Ads on apps and websites based off of Facebook companies: Which lets third party websites and apps serve ads based on your Facebook data. Ads with my social actions: Which serves ads to your friends based on things you've liked. You can turn any or all of these off by clicking edit in the upper right next to the option, selecting "off" or "no" from the drop-down menu and then clicking close in the upper right. 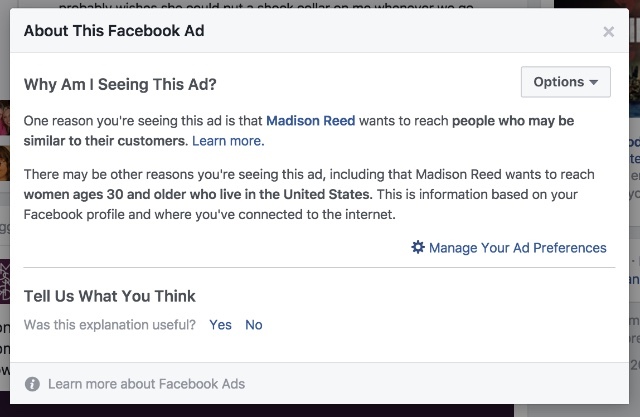 This won't stop you from seeing ads and it won't stop Facebook from tracking your data, but it will stop advertisers from using it to target you. How can I change the Facebook ads that I see? Sometimes Facebook makes bad assumptions about what you like or dislike, and you just want to stop seeing certain types of ads. Fortunately, this is easy to tweak. When you see an ad you dislike, you can click on the arrow in the upper right to change your ad preferences. You can find out why Facebook is showing it to you, hide it or say you already own the item it's advertising. Hiding it should prevent you from seeing the ad — and others like it — again. 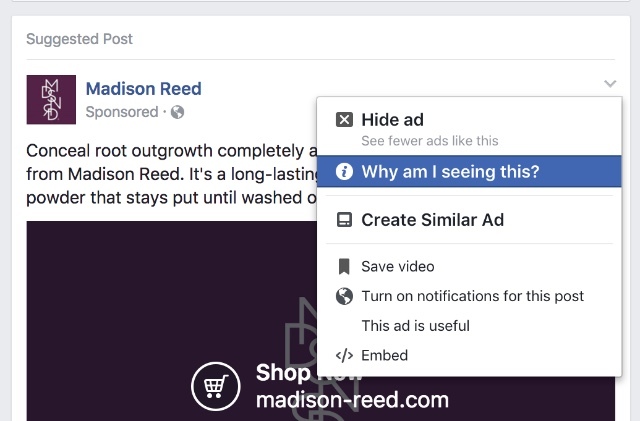 You can also go to your ad preferences directly to see what Facebook thinks you're interested in — and tries to advertise to you. You can browse through your interests and categories and simply click the X in the upper right to remove any topic. Once it's removed, Facebook should stop trying to advertise that type of product. It's tough to keep your personal information completely private online — especially if you use social networks — but you can take some steps to keep yourself safe. Take a look at simple ways to protect your privacy and how to stop your web browser from giving up your personal data. facebook has just changed its privacy settings, if you want to know about what information facebook shares with advertiser then read this. its explain where you can find your privacy settings.